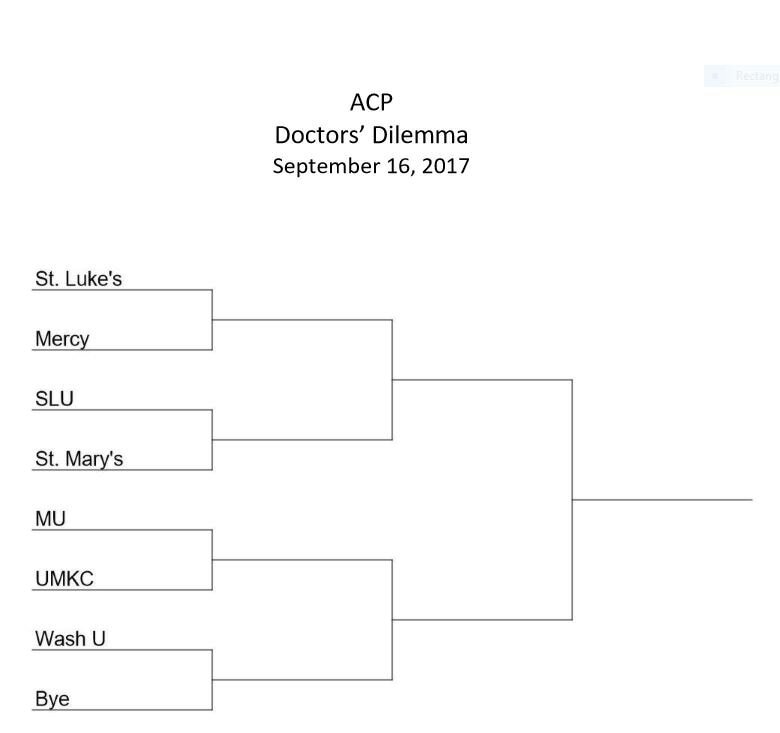 The 2016 Missouri Doctors Dilemma contest will be at 3:50pm Saturday, Sept 17, 2016 in Salon A at Tan Tar A. Teams competing are: UMKC, MU, St Luke's, Mercy, St Mary's, SLU and Wash U. The winning team will be entered into the IM17 competition in San Diego. 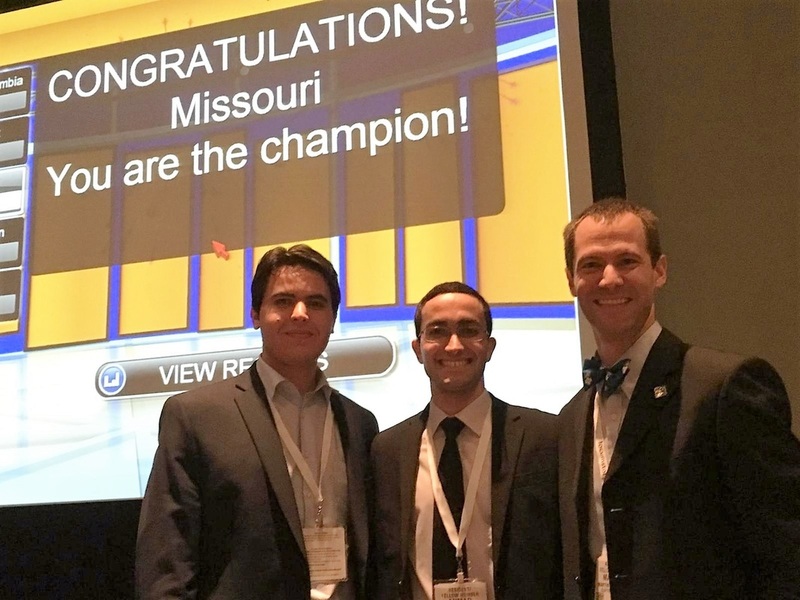 SLU Doctors Dilemma team won the 2015 Missouri Chapter contest and its first round match at IM16: Drs Anas Gremida, Ahmad Al-Taee, and Martin Schoen. 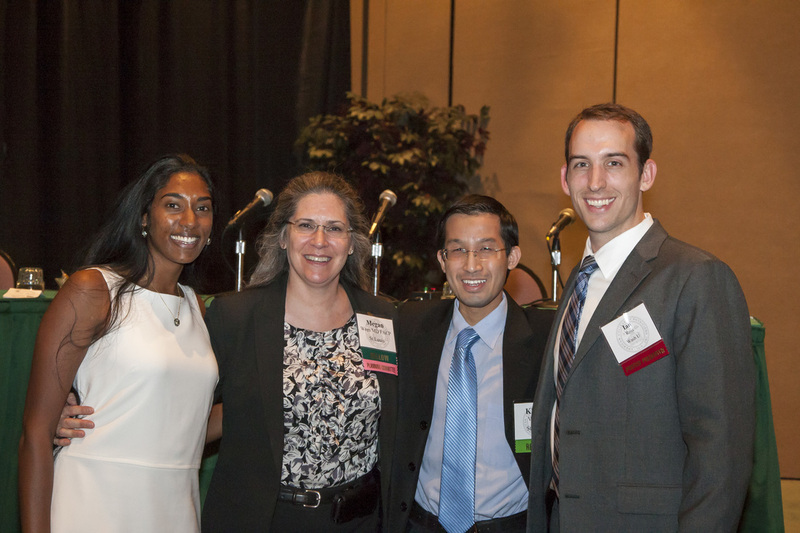 Wash U after winning the 2014 Chapter contest: Drs Anuradha Godishala, Megan Wren - Associate Program Director, Khoan Vu, and Ian Ross. Participants should currently be in year 1-3 of a Missouri Internal Medicine Residency Program and not a chief or in a fellowship. Three quarterfinal matches will precede the semifinals and finals. All questions are of equal value. The emcee will read the question aloud. A team may buzz in before the emcee finishes reading a question; however, the emcee will stop reading the remainder of the question. You have ten seconds to answer. No answer should be stated until the emcee recognizes the team which buzzed in first. After the question has been completely read players have ten seconds to buzz in. If nobody buzzes in we move to the next question. Teams will score one point for a correct answer. Teams will lose one point for an incorrect answer. After an incorrect answer, the question will be read from the beginning if it was not completely read before the incorrect answer, and the other team may buzz in. If the emcee has completely read the question before an incorrect answer, then the question will not be restated. Once buzzing in, the team must answer the question within ten seconds. The second team has ten seconds to buzz in after the emcee is finished reading. The second team will have ten seconds to answer after buzzing in. If the second team chooses not to buzz in we move to the next question. If tied after 15 questions, a final question asked as a final tie breaker. The Missouri Chapter of the ACP has a buzzer system with lockout so it will determine which team buzzed in first. Although we have made every attempt to avoid equivocal or controversial topics, debate over any answers will be settled by our panel of judges comprised of IM Program Directors and Associate Program Directors. Applauding is not allowed between questions. We will keep a very quick pace. We ask the audience to remain quiet. The emcee will state the score between each question. Finally, the primary rule is to have fun and learn.